MTSU Board of Trustees announc..
11 Reasons You Became a Blue R..
MTSU’s Department of Recording Industry is part of Billboard‘s annual list of America’s top music business schools for the sixth year, once again joining its counterparts across the country as top producers of ready-to-work music industry pros. 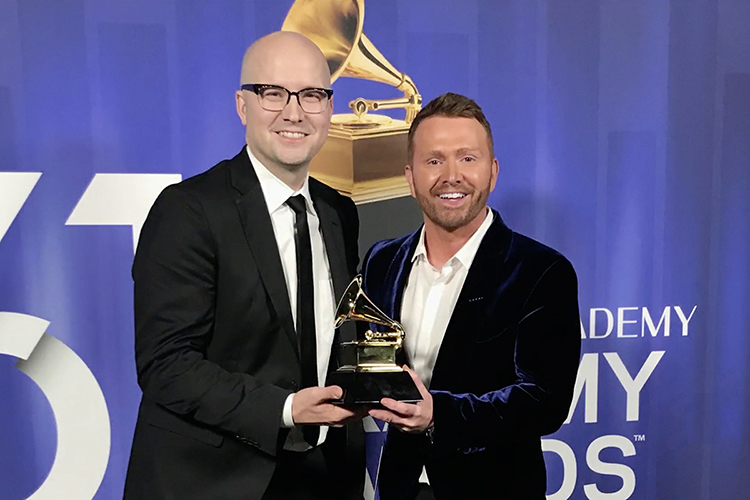 The trade magazine brags this year on MTSU’s nine alumni who worked on 2019 Grammy Award-nominated recordings, singling out songwriting Grammy winner Luke Laird (B.S. 2001) and the NBC News feature on the program that aired on Grammy night, along with a note on MTSU’s now-sixth annual Grammy Week trip connecting students and staff with area alumni and industry professionals. In its mentions of distinguished alumni, professors and/or guests for each school, Billboard included 2012 MTSU commercial songwriting grad Mitchell Tenpenny, who’s nominated for new male artist of the year at the upcoming Academy of Country Music Awards April 7. “This year marks a milestone for our department because we have reached a new level in terms of national visibility, opportunities for students and success of our alumni,” said department director Beverly Keel. “This honor is the result of several decades of hard work by our faculty. “The reputation of MTSU continues to spread as our graduates rise to the tops of charts and companies. Our alumni include Chris Young and Lady Antebellum’s Hillary Scott, as well as new country star Mitchell Tenpenny and members of the country group LANCO, who were just named new group of the year by the Academy of Country Music. Multiple programs earned accolades this year from Billboard for their work at the annual Bonnaroo Music and Arts Festival in nearby Manchester, Tennessee, which MTSU’s been staffing with recording industry and Department of Media Arts students for experiential learning opportunities since 2013, when the university first established a partnership with the festival’s organizers. The magazine also praised some schools for their new Grammy U memberships and affiliations with CMA EDU, the college arm of the Country Music Association. MTSU was one of the first Grammy U chapters created when the Recording Academy established the college-focused program in 2006, and CMA EDU created its MTSU chapter the year after the organization launched in 2011. You can see the full Billboard article online here or read a PDF version here. 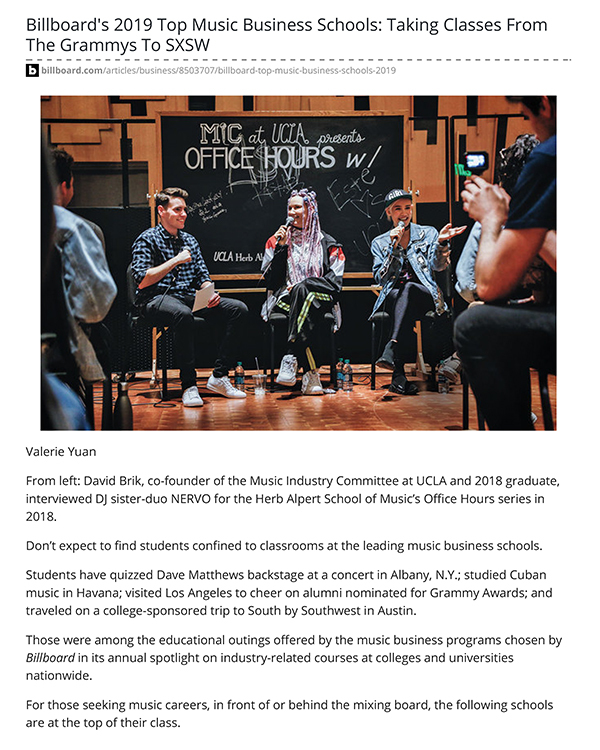 Click on this page to see the complete PDF version of Billboard’s 2019 Music Business Schools story. The site’s list, which you can read here, includes Georgia Tech, American University and Texas State, along with Nashville’s Blackbird Academy, but it also lists outdated, closed programs like those at International Academy of Design & Technology and The Art Institutes. The Department of Recording Industry at MTSU, which awarded its first Bachelor of Science degree in 1974, also was part of The Hollywood Reporter’s “Top 25 Music Schools” international listings for 2014, 2015 and 2016. Recording industry undergrad majors at MTSU can focus on audio production, commercial songwriting or music business. 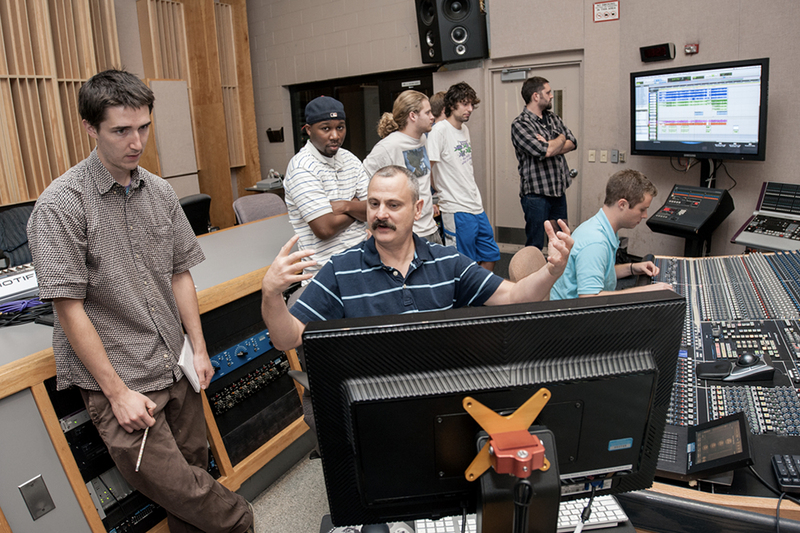 The Master of Fine Arts in Recording Arts and Technologies degree prepares MTSU graduate students for advanced work in audio production, recording and integrated electronic media. The university also recently added a new MBA degree with a music business concentration, allowing graduate students to take courses in accounting, economics, finance, information systems, management, marketing, and recording industry to cover every facet of the business end of music. As of February, more than 1,500 students are recording industry majors at MTSU, comprising about two-thirds audio production majors and one-third music business or commercial songwriting majors. The department opened its first campus recording studio in 1980, was the first program in the country to release a fully student-created CD in 1985, established the MFA in recording arts degree in 2005 and began a Commercial Songwriting Program in 2008. It also collaborates with MTSU’s School of Music on a “music industry” minor concentration that allows students to minor in music-industry entrepreneurship or recording industry. MTSU alumni, former or current students, and faculty from across the university have been a part of more than 50 Grammy Award nominations in the last decade. So far eight have won a total of 19 Grammys, including five repeat recipients, in categories from classical to country to gospel to bluegrass, since 2001. The annual Country Music Association Awards regularly include nominations for MTSU-trained professionals, including several repeat contenders. You can learn more about MTSU’s recording industry program, part of the College of Media and Entertainment, at www.mtsu.edu/recording-industry.